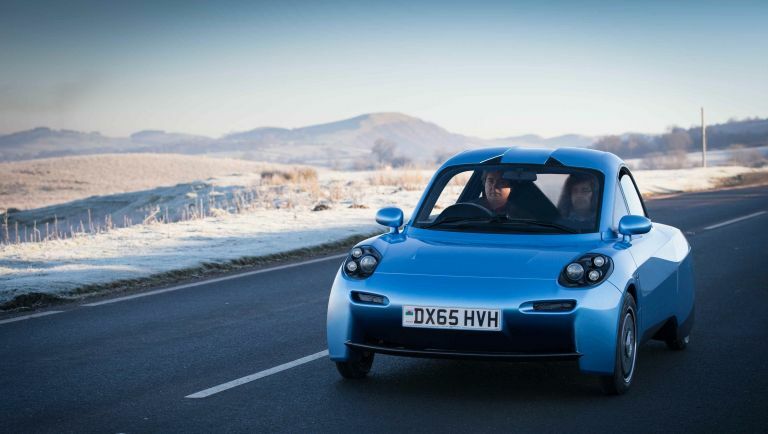 So this is the Rasa, a new hydrogen-powered car that, thanks to a recent visit to T3 Towers by its creator Hugo Spowers, we recently got to take on a little jaunt. So how was it? Well, the ride itself was beset by the typical English weather, with the Rasa cruising around a rather wet and windy Bath, however there's no doubting that this is a fully-functional - albeit in prototype stage - road-legal hydrogen car. The ride is a little noisy and the prototype fitted with zero mod-cons, however this thing actually works and allows you to even hit a top speed of 60 mph. Simply put, T3 was impressed. Let's go into a little more detail though. Firstly, how does it work? Well the Rasa's makers, Riversimple Movement Ltd (which was founded by Spowers) are quite clear about this. Hydrogen passes from the fuel tank through a small 8.5 kW fuel cell, where it combines with oxygen to form water and electricity to drive four electric motors positioned on each of the car's wheels. In addition, over 50 per cent of the kinetic energy produced by the Rasa under braking is recovered and turned into electricity to boost acceleration via a bank of supercapacitors. Combined, these systems allow the car to deliver a range of 300 miles on 1.5kg of hydrogen and a fuel economy equivalent to 250 mpg. For comparison, a diesel 2015-model VW Golf can deliver up to 45 mpg. We know what you're thinking though, how do you fuel or get the car serviced? Well this is where things get interesting. Hugo and Riversimple have built the Rasa based on a new “sale of service” model of ownership. This basically means that as you would lease a normal car, you don't buy the Rasa but lease it too, with the money you provide each month covering the car's fuel expenses, insurance, maintenance and even repairs. According to Riversimple, the benefit of this model is that it aligns the interest of the customer and the company, as it's in the company's best interest to keep the car on the road and functioning as, if not, they are losing out on income. Hydrogen-powered cars are still in their infancy, so Hugo and Riversimple see this as a great way to both help themselves and put road-legal hydrogen cars on the road. The key take away here though for T3 was that the Rasa is a fully-functioning hydrogen-powered car. It's a little piece of the future but now, here in 2016. In fact it was quite funny really that T3 got to drive around in the Rasa in the old city of Bath, as it really helped juxtapose how cutting-edge yet simply realised the technology in this car was. The car weighed just 580kg and sported just 18 moving parts in the entire powertrain, yet there we were, driving around the Georgian architecture as if we were in a classic Mini Cooper. It just worked and, for a technology that many in the industry have already written off as a pipe dream, it was like a slap in the face. The Rasa just worked and, talking to Hugo and listening as to how Riversimple can source the hydrogen and support the vehicles on the road, it was hard to see how the project can fail. So, this is a very much keep your eyes peeled scenario, with the Rasa running into a 12-month public Beta trial later this year. If that is successful, then expect a full production model in 2018. Remember, you heard about it first here on T3! Liked this? Why not check out our guide to the best hybrid cars.